I listened to Trevor Noah’s Born a Crime and Tiffany Haddish’s The Last Black Unicorn during last weekend’s roadtrip and was struck by the level of childhood trauma they each experienced. Oprah also talked about childhood trauma over the weekend and Bruce Perry’s books on the topic have become bestsellers. Children who endure four or more Adverse Childhood Experiences (ACEs) often find that their adult years can be more difficult in terms of their physical, emotional, and social health. Educators and health professionals are now being trained to ask students and patients, “Tell me about your childhood” in hopes of uncovering experiences that might have been traumatic and subsequently helping to explain adult issues. As a parish pastor, I once looked out at the congregation each Sunday and was aware of some of their traumas. I often knew who had been sexually abused by a parent or sibling, who had lived with an alcoholic father or mother, whose family member was in prison, and who had witnessed domestic violence. Many of these parishioners were in therapy. 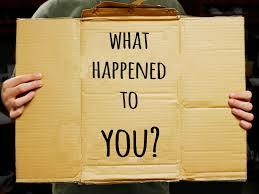 Many were also dealing with adult issues related to their childhood trauma. This is not something I learned about in seminary, but there are many resources out there to help us better understand the people in our pastoral care. Both Trevor Noah and Tiffany Haddish have obviously risen out of both poverty and abusive situations. Adverse childhood experiences do not condemn people to lifelong sorrow. In fact, healthy communities can counter the impact of ACEs. A healthy church offers belonging, purpose, and deep comfort. There are so many many people seeking exactly these things – but they don’t believe they can find it in a church. Can they find it in your congregation? I hope so. Image source. Trauma care professionals suggest that we ask, “What happened to you?” rather than “What’s wrong with you?” when discussing behavioral health issues with both children and adults. Your question, can they find it in a congregation?, is the perfect question. But, in addition, can they find it in our denomination? With all the hurt and lack of love and acceptance in our communities, our denomination would do well to take a step back from many of our corporate energies and decisions and look at how we might best extend the love of Christ to those in the pew. The hurt is palpable. People who come into the sanctuary looking for a renewed strength in their hearts and daily lives cannot relate to all the efforts we put into Presbytery meetings and beyond. Help us to bring love and caring to those right in front of us…..I pray. As a school chaplain at an inner city elementary school, I see the extent of ACEs every time I step on the campus. I work with small children to help them but I know the parents are hurting, too. I wonder, every time I leave the campus, who helps the adults?